For the next two weeks, I’m traveling in Russia’s Far East on Silver Discoverer. Come along to explore exotic cultures and stunning landscapes — in the luxurious style that only Silversea Expeditions can deliver. Join me on a journey where few ships have sailed before in one of the world’s most remote regions. Long closed to Westerners, the Russian Far East is one of the planet's least explored destinations. The Kamchatka is a geothermal wonderland, while in nutrient-rich waters of the Bering Sea support vast populations of birds, whales and other marine life. July 31, 2014 Nome, Alaska Once all guests have embarked, we will have a safety drill before we depart on our spectacular Great Northern Expedition. This afternoon you will be introduced to the expedition team that will be accompanying you in the Russian Far East. Tonight we invite you to familiarise yourself with your new home away from home, meet some of your fellow travellers, and enjoy the first of many memorable meals in The Restaurant. August 2 Provideniya, Russia Today we will be time-travelling: we will have left Nome on July 31, but get into the Russian Far East 19 hours later on August 2! Attending a lecture or perhaps a photo-workshop- both will prepare you for the Russian Far East and its many different facets. The Expedition Leader will brief you on activities of the following days and after a hearty lunch you will be ready for the Russian Far East. After clearance into Russia through the former Soviet military port of Provideniya, we will be treated to a traditional welcome of Vodka, black bread, and sweets before enjoying a cultural dance performance and joining our local guides for a walking tour of the town and its small museum. August 3 Cape Navarin & Gabriela Bay, Russia Boasting one of the most abundant seabird colonies in northeast Russia, Cape Navarin is located in the northwestern part of the Bering Sea to the south of Anadyr. Tens of thousands of seabirds can be seen on this cape’s spectacular cliffs. Setting out on Zodiac, we will have the chance to look out for birds such as the Tufted Puffin and Black-legged Kittiwake. Another sight to see is a walrus haul-out. If we are fortunate, we may also come across the Grey Whale, who occasionally moves through these waters. Gabriela Bay’s wetlands dot the coastline, revealing the wildflowers that carpet the tundra, such as forget-me-nots and dwarf azaleas. The animals here regularly move between locations, so finding them is a matter of luck. However, we will be on the lookout for walruses, Brown Bears and Beluga Whales. 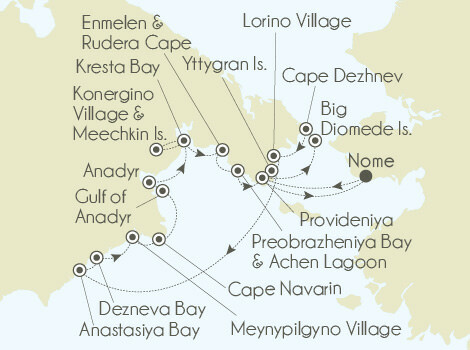 August 4 Cape Dezhnev & Anastasiya Bay, Russia Our Zodiac fleet is at the ready to explore the region of Dezhneva Bay. Some of the animal species we may spot include Grey Whales, walruses, reindeer, and Brown Bears. There is something for our birders as well. Keep on the lookout for the White-fronted Bean Geese and Whooper Swans that frequent a lake not far from the beach –using this area as their nesting site. Anastasia is the perfect place for bird watching. Time permitting, our onboard ornithologist will offer a hike ashore to see the variety of shore birds that nest in this area. You may even have the opportunity to photograph the walruses hauled-out along the beach. When ashore or during a Zodiac cruise our guest photographer David Wright and our onboard photographer Richard Sidey will help you find interesting motives and based on interest might lead photography walks. August 5 Natalia Bay & Glubokaya, Russia Part of a remote nature preserve Natalia and Glubokova Bay are still used by nomadic reindeer herders who might be seen along the streams coming down the different valleys. We intend to go ashore and conduct some nature walks. August 6 Meynypilgyno, Russia Taste local caviar and salmon, and glimpse life infused with time old traditions in the small Chukchi fishing village of Mainapilgino, set on a long spit of land along the Bering Sea. Treating us to some real Chukchi hospitality, the village ensemble will perform some of their traditional dances. Birders rejoice, the village is a breeding spot for many species of migratory birds, including Red Knot and critically endangered Spoon-billed Sandpiper. August 7-8 Anadyr, Russia Located at the mouth of the Anadyr River is Anadyr Bay. During the late morning we will sail through Anadyr Bay -known to have Beluga and occasionally Grey Whales- to reach Anadyr Port, the administrative centre of the Chukotka Autonomous Okrug, Russia, where Silver Discoverer will anchor after lunch. We will mix with the locals at the Russian Orthodox Church, the local museum, and attend a cultural performance. August 9 Kresta Bay, Russia We will travel by Ural truck inland from the small harbor of Egvekinot across the expansive tundra, to the point where the 180 Meridian intersects the Arctic Circle. This is an incredible opportunity to experience firsthand the amazing habitat that dominates so much of Chukotka. August 10 Konergino & Meechkin Island, Russia Hosting us today is the small village of Konergino, located on the eastern shore of Kresta Bay, south of Egvekinot. Konergino is a reindeer-herding settlement, like other villages in the Iultinsky District of Chukotka Autonomous Okrug. The village's name is derived from the Chukchi Kei'i'yergyn, meaning "curved valley." After Konergino, Silver Discoverer will relocate to Meechkin Island, where a large walrus haul-out can be found. Although their numbers have declined in recent years, Ringed Seals can still be seen around Meechkin Island. August 11 Enmelen & Rudera Cape, Russia | Preobrazheniya Bay & Achen Lagoon, Russia The small village of Enmelen is populated by a mixture of Chukchi and Yupik people, who support themselves through a combination of reindeer herding, and the hunting of sea mammals. We may count on a warm welcome from villagers, who will treat us to a concert, local food, and Inuit Games. Roam the blossoming tundra with the Silversea experts and our two photographers in Achen Lagoon, and observe the wealth of bird life in Preobrazheniya Bay. Keep a watch for Common Puffins, Horned Puffins, and Least Auklets. A walk to the cliffs will reveal the fascinating panorama of the bay. August 12 Big Diomede Island, Russia During the morning we will be cruising the Bering Strait. This will be an opportunity to watch out for wildlife from the outer decks, or attend a lecture giving you further insight into this remote part of the world. A workshop reviewing and editing photos taken so far might be another option. Getting ever closer to the International Date Line we will approach Big Diomede, located 28 miles (45 km) off Cape Dezhnev. Set right in the middle of the Bering Strait, Russia’s easternmost point can be found here. Once a military base during WWII and into the Cold War, the island is now unpopulated, housing only a Russian weather station and a base of Russian Border Guard troops. Less than one mile east lays the International Date Line between Russia and the United States. Less than 4 km away is Little Diomede (USA). We hope to encounter hauled-out walruses on Big Diomede’s shore. August 13 Lorino Village & Yttygran Island, Russia Our next stop is in the Providensky District of Chukotka Autonomous Okrug, Russia. The small village of Lorino is known for its reindeer herding and the Chukchi people. After a short welcome ceremony, the villagers will show off their skill on dog sleds, and will even offer you the chance to enjoy a ride on a sled; a short “cruise” in a local skin boat, or participate in a regatta! Before returning to the ship you should try some of the local food that the villagers will prepare for you. During lunch and the early afternoon we cruise the Bering Sea to reach Ittygran Island. On the northern shore of this island is the famous “Whalebone Alley” –an area with large numbers of carefully arranged skulls and whalebones. It is not only on land that we can see evidence of whales; Grey Whales are known to roam the seas around Ittygran and we might spot them during our approach or after our departure. August 14, 2014 Provideniya, Russia – Technical stop for outward clearance only | Cross International Date Line | Nome, Alaska An interesting day is yours to enjoy. We will spend the morning in Provideniya for outward clearance. You can start with a late breakfast and decide whether you want to go through the pictures taken during this voyage or attend a workshop by David Wright, getting more tips about editing your wildlife pictures. Enjoy a Hamburger or Hot-Dog during lunch –as a contrast to the local food you tried over the last few days. Attend the final Recap and watch Richard Sidey’s Voyage-DVD –both a good opportunity to be reminded of all the unusual and wonderful wildlife and scenery seen during our cruise. Join the Captain for his Farewell Cocktail Party and be pampered by the Chef and galley-team for one last dinner. Enjoy the company of your fellow travelers in the Bar as you once again become time-travellers: you will reach Nome before you left Providenyia! An easy way to follow along using the social media platform of your choice. Cruise with us on Instagram. Cruise with us on Twitter @avidcruiser.